We have 1 small Finnish Spitz head sticker (front view) and 2 different car window stickers – the Society’s own logo sticker and a Finnish Spitz head sticker (side view). 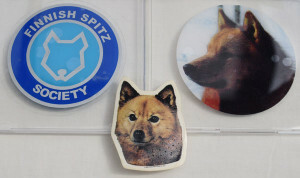 A round vinyl car window sticker produced for the SPJ in Finland and featuring a Finnish Spitz head (side view). 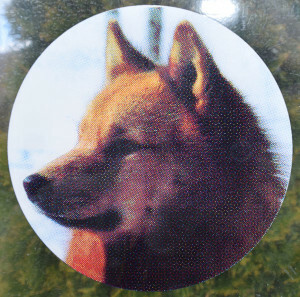 The diameter is approximately 10 cm and the weight (including waxed backing paper and surround) is around 4 grams. 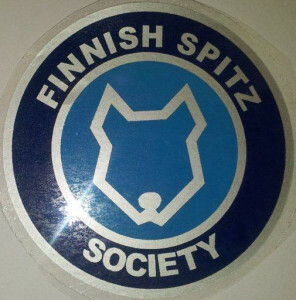 Finnish Spitz head vinyl sticker/decal. 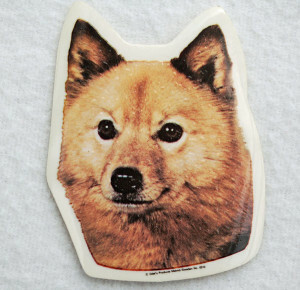 Peel off waxed paper on reverse side to reveal adhesive. We've had these for a few years now and there is some small raised "bubbling" on the front, hence the reduced price. But they still look good! Size 6 x 7 cm. Weight less than 1 gram.